It’s not your imagination: March tends to bring a spike in fires across Mass. Firefighters battling a massive fire at New England Casket Company on Bennington Street. While March often brings pleasant thoughts of more daylight and warmer temperatures, it also consistently brings a spike in building fires across Massachusetts. A recent spate of fires reported this month from the Berkshires to Martha’s Vineyard shows just how tragic the month can be. Two people died in a Wellfleet fire on March 11. 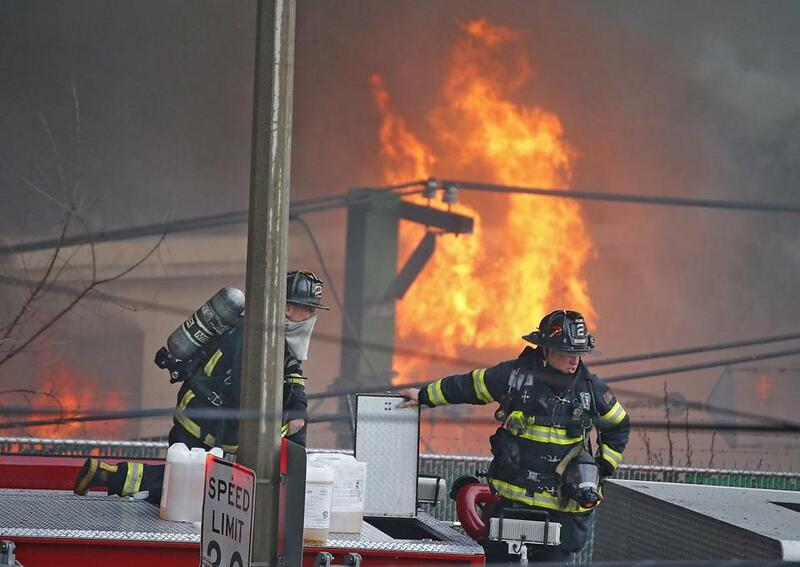 Several days later, a massive, smoky nine-alarm blaze at a casket maker shut down a swath of East Boston, forcing the evacuation of more than 100 homes. The following day, 6-year-old twins and a man were killed and two others were injured by a Pittsfield fire. Two days later, another person died in an Ashland fire. On Wednesday morning, a Revere home went up in flames, displacing 21 people from six units in the duplex-style building. Earlier Wednesday morning, more than 80 animals, including newborn lambs, were killed when a three-alarm fire destroyed a barn on a farm in West Tisbury. The fires are consistent with data reported to the state in recent years, statistics show. In 2017, the most recent year available for data, there were 1,676 building fires in Massachusetts in March — more than any other month that year. During a three-year span ending with 2017, March saw the second-highest number of fires, on average, trailing only the month of January. Mieth has worked at the department since 1984. There are historically more building fires — and also more fatal ones — during winter months because the cold weather drives people to spend more time indoors, engaging in potentially hazardous activities, including smoking and cooking, Mieth said. The cold lingers into March. And it’s around this time of year that heating systems — also a common source for fires — can get worn down after working hard all winter, causing malfunctions that can spark fires, Mieth said. The use of portable space heaters is another common cause of fires, she said. Mieth said while fires overall have spiked this month as they usually do, there have been fewer fires caused by heating sources so far. “We’ve got a campaign, and we’ve been trying to work on heating fires, and we’ve brought them down over the past decade,” Mieth said. The six deaths determined to be caused by fire in Massachusetts so far this month, as well as the 13 overall so far this year, appear to be approximately in line with, if not slightly below, counts from recent years, she said. Mieth stressed that residents should ensure their homes are equipped with working smoke detectors and that they have an escape plan with at least two exit routes and a designated meeting spot outside. The plan is so no one rushes back into a burning building looking for a loved one who may have already escaped.